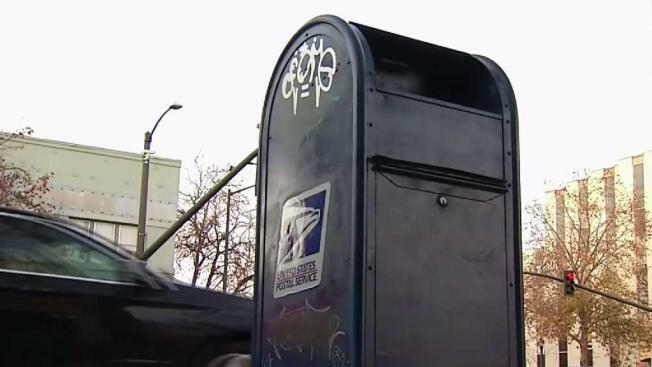 U.S. postal inspectors on Sunday were trying to track down the person who put a suspicious device in an Oakland mail collection box. The threat forced two major streets to shut down for hours Saturday night. Investigators said it was not a piece of mail; it was a device dropped inside a blue collection box. Postal inspectors were still trying to figure out exactly what the device is. The device was found by a postal carrier making a usual stop at a collection box on the corner of Stanford and San Pablo avenues. "It looked very, very suspicious," USPS Inspector Jeff Fitch said. Police and the Alameda County sheriff's bomb squad were called in to determine if it was an explosive device. The bomb squad ultimately destroyed the device. The investigation and detonation forced sections of San Pablo and Stanford avenues to close for nearly nine hours. "I don't know who would want to to put a bomb over in our neighborhood," resident D'Anthony Niblet said. The incident is the second of its kind in less than two weeks. On Nov. 24, an explosive device was mailed to a home in Alameda's Bay Farm neighborhood. In that incident, a woman opened the package, and it exploded. "At this time, we are not making a connection to both of those cases," Fitch said. "We are looking at this as an isolated incident." On Oct. 19, an exlposive device went off after it was mailed to someone in East Palo Alto, and investigators believed that incident could have been connected to the Nov. 24 incident. Investigators canvassed the Oakland neighborhood Sunday, looking for surveillance cameras that may have captured footage of a suspect or suspects.